My waffle iron is probably the least used kitchen appliance I own. I love waffles, and I make pancakes all the time, but for some reason I don't pull out the waffle maker all that often. We recently celebrated my husband's grandma's 87th birthday, and the whole family got together to have lunch and celebrate with her. Her request for lunch? Nothing other than her favorite meal- waffles. She loves hers with whipped cream and strawberries. That got me thinking, I needed to dust off the ol' waffle maker and start cranking out some warm, crispy waffles. So this Saturday morning, I rolled out of bed and made my way downstairs. I could hardly wait to sink my teeth into some crunchy, fluffy waffles. My husband and son were both surprised to hear that we were having waffles for breakfast. Jayden and I got to sample them first since hubby was taking his sweet time this morning. One bite and I knew my waffle maker would be getting alot more use. They were heavenly. Crispy and fluffy- they had just the right texture. I drizzled mine with pure maple syrup and thoroughly enjoyed every crunchy, sweet bite. I know alot of you don't think there is enough time in the morning to make a homemade breakfast. That couldn't be further from the truth. The trick is to plan ahead. I mix the dry ingredients together the night before, that way all I have to do in the morning is add the wet ingredients and fire up the waffle maker. You can have fresh, tasty waffles in 10 minutes or less. These freeze well so they are great for those rushed mornings when you need a really quick breakfast. Just pop one in the toaster on the low setting and you'll have breakfast ready in no time. Shake buttermilk well and pour into another bowl. Add melted butter and eggs and whisk until combined. Add buttermilk mixture to flour mix and whisk just until combined, don't overmix batter. Spray or brush oil onto hot waffle iron and add 1/2 cup of batter into each waffle mold. Cook waffles according to manufacturer's instructions until golden and cooked through, about 3 minutes. Transfer cooked waffles to a rack in the oven to keep warm. 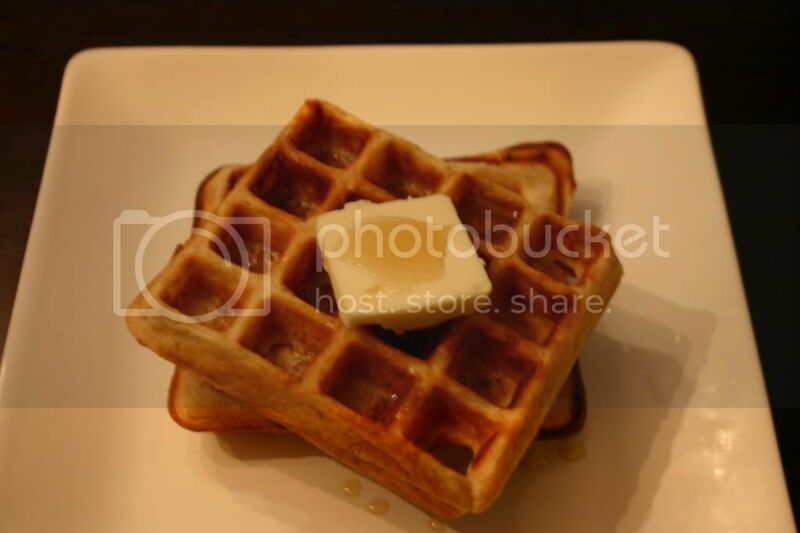 If not using a belgian waffle maker, use 1/3 c waffle mix for each mold.